Yes folks it's finally the weekend and only 4 days until Christmas! I am still pondering how this happened upon us so quickly but here it is again! Of course I am in my usual spot of behind the eight ball with gifts and such but that is the norm. To make things even more stressful I lost my keys but lets not get derailed with that dilemma. Nala has been constantly whining and I am pretty sure it's mainly for attention. Meanwhile Sylva has also been pining away for his pop who has been out of town a couple of days. No one appreciates the mom who does all the dirty work. Though when it comes dinner time I am a celebrity around here! I have attached a link for 10 things you can do to keep your pet safe during the holidays. My personal recommendation is to monitor carefully relatives who feel it's okay to share their piece of chocolate cream pie with the dog. If you don't it may result in a all nighter cleaning up unidentifiable piles of poop/vomit! From our family to yours wishing you all a joyous Christmas and a happy New Year! So it's been a while since I have posted anything to my blog. I shamelessly admit I have been either too busy or too tired at night to sit in front of the computer and think. My apologies. In the meanwhile Nala and Syla have been good. Sylva has transitioned into the fall season with his usual dermatitis. It has started to calm down and with a good bath he may just smell acceptable again! Nala is very whiney lately. I am a little rusty with my bulldog translation but I think she is just demanding more attention! She will typically lie on her couch ( and I mean her couch ) and do that whiney bulldog thing until someone comes over and pets her. My husband over indulges her. He will pick her up and have her sit on his lap and look at the computer with him. Hopefully he hasn't given her my password to my Amazon account! I am not sure what has sparked this endless need for attention. Perhaps just a phase, time will tell. It's been months since my last posting! My old laptop finally gave in and froze up, where it still remains in a cryogenic coma under my bed! My new Lenovo is quite nice but I am still trying to master the learning curve of Windows 10! In the meanwhile Nala and Sylva are fine! The summer past by like a wink of an eye and here we are staring down at October..just about! 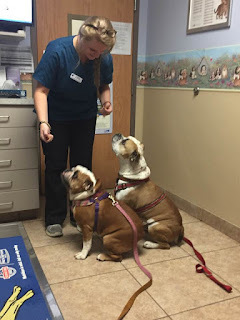 We went to the vet last week for a double appointment. Nala had her wellness check up and Sylva was due for his distemper shot. We made a late evening 8:10 PM appointment which worked out well. No one was there in the waiting room and the two of them had the run of the place! Of course we had our side issues, Nala had an infected face wrinkle and Syl his usual belly dermatitis. 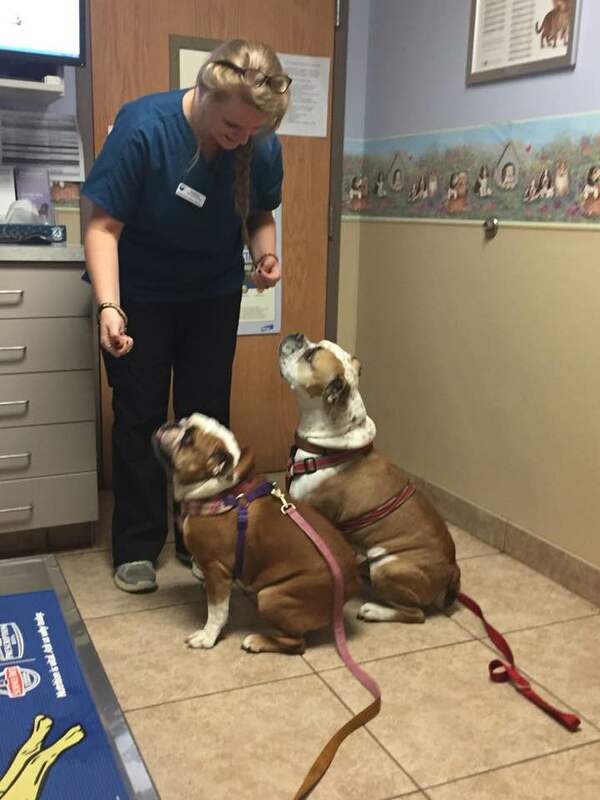 They were well behaved patients though and received several treats for their good behavior! Hey no matter what happens at the veterinarians stays at the veterinarians ...once you get the treats the bad stuff is all behind you! 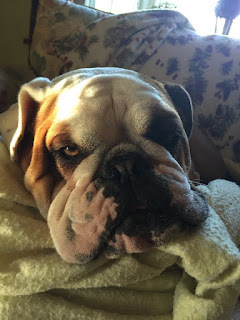 Hope to see you all back here ...same bulldogs same blog! I haven't posted in a way long time so I decided with a new post should come a new look! I am trying this new theme that blogger recently introduced to see how it flows and any comments are welcomed. Happy Easter and Happy Passover all! So the ongoing foster failure and adoption of Sylva is going well. He has found his place and Nala is all good with him. Though they don't actually play together they do harmoniously exist side by side. Sylva is a aggressive chewer and will gleefully chew on a rubber ball all day! Nala is the passive observer and still maintains sole ownership of the living room couch! Today we had at least a half foot of snow or more that caused schools and most businesses to close in the New York city tri-state area. It always looks pretty from the inside out but when the storm is over and you have to dig out ...well it's not so pretty then. Nala and Sylva like to run laps in the fresh snow but it's always a quick out and in for them! Here is Nala giving us her fastest sprint to date! Enjoy! I hope all of you had a joyous holiday and are getting ready to celebrate the new year 2017! We have had peaks and valleys in the past year but all in all no complaints. My son Will and his high school sweetheart Ashley were married in October. That was the highlight of my year and what a beautiful event! I couldn't be happier or prouder of them both!! We then rounded out 2016 with an addition to the family...dog family that is! 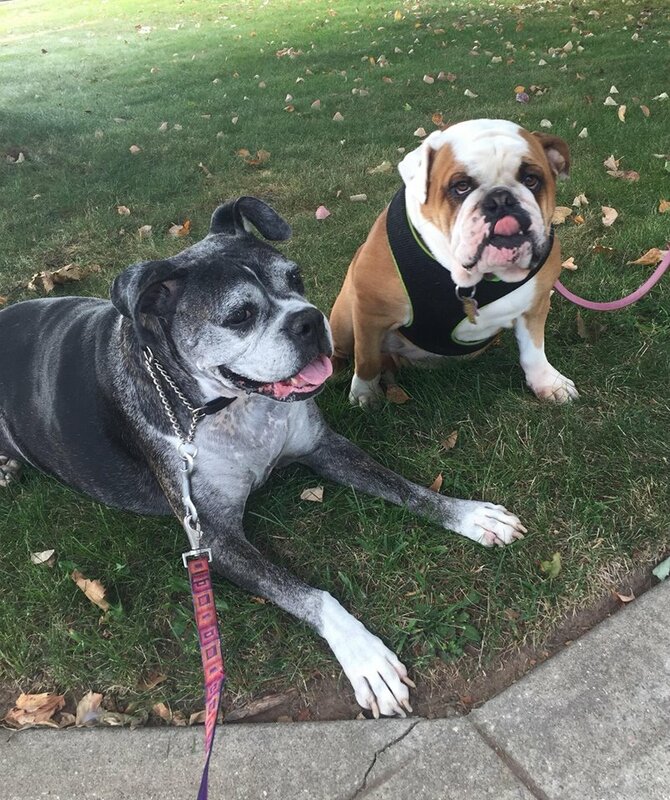 The Long Island Bulldog Rescue contacted me and said they had a dog who needed fostering. I had been pondering the thought of getting another bulldog to keep Nala company. She had become such a couch potato my thinking was that may activate her inner dog! I said yes and went to pick up a an Olde English Bulldog named Sylva. The rescue told me he was a healthy 3 years old and his owner had to surrender him since she was unfortunately being placed in a nursing home. She had been diagnosed with dementia. At first I was hesitant. He kinda looked like a bulldog except he had long legs and an extended snout! His tail a corkscrew knot that pointed southwest! With a bit of an intimidating look he made one take a step back when approaching him.Well anyways it all depended on how he got along with Nala. He was not fixed so he was relentlessly bothering Nala! She let him he know in her diva manner that she definitely was not interested! When we got him home he was antsy. He played with every dog toy in the house and wore himself (and me too) out by the evening. The worst of all my dad did not like him. He felt he was too big and too active. I called the rescue and voiced my concerns that this may not work. They said give it time. My dad would come around and Sylva would relax and adjust to his new home. Sure enough both happened. Today I saw my dad petting him when he thought no one was looking and Sylva has found his place in the house where he plays second dog to the resident queen. He has proved to be gentle and loving and now that he is fixed could not be bothered giving Nala a second glance. I guess the old saying "be patient the storm will pass" is true! Okay Sylva ole boy looks like you found your fur-ever home! A happy and healthy 2017 to you all! So I am staying ....right?! 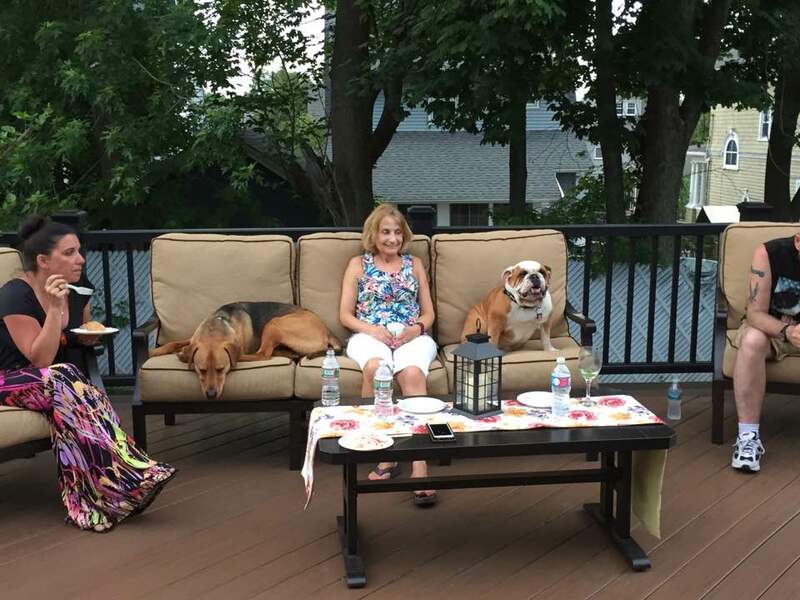 Nala on the deck with her new brother. Regal looking in the morning sun! Sorry I have been away so long from the blog. Guess one gets lazy during the summer months. Not that we have done much this summer. We have pretty much been doing a stay cation all summer long. Nala is okay with that! The hot weather does not agree with bulldogs and their preference is the couch and the air conditioning on high! We now look further to going for evening walks in the cooler air and meeting up with our other dog friends. 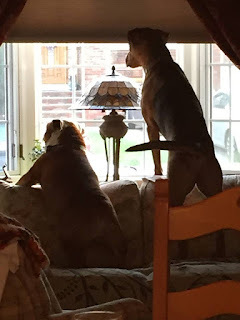 A few months ago Nala lost one of her dog pals, Bailey the boxer. She was up there in age 9 or 10 which is old for a boxer. She was such a sweet girl and we will miss her very much! Today we have moved out the old furniture in the family room to make way for new furniture being delivered tomorrow! Nala is confused by the empty room! 'What's going on here?! Where's the green couch?! Hope they don't take my couch in the living room too!" Don't worry Nala there is just going to be more options for you to practice your art of the nap! Have a good week all! "Yes indeed that was delicious!" commented Nala as she finished her dinner on the deck! Wow Nala, I didn't think you had that much of a tongue in your little head! "Do you see what I see?! Yup yup....squirrellll!!!! I hope everyone had an enjoyable Easter holiday! 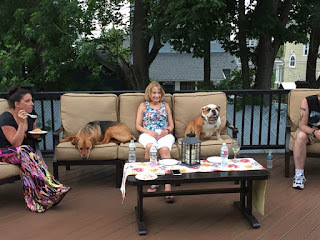 Nala had lots of fun visiting with friends and family. Though the Easter "bummy" as Nala refers to him left her nothing much except some hard boiled eggs. With that spring has finally arrived in the NJ/NYC area with trees budding and kids returning to their outside playtime. More people are seen walking their dogs which makes you wonder where everyone was during the winter months. Probably backyard business for the most part.It's time for everyone to put on their walking shoes and get out there! Right Nala! Nala?! ZZZZZZZZZZZZZZ! Well at least some of us will!
" I had a horrible dream that I was the Easter bunny and kids were throwing rotten eggs at me. Thank goodness it was just a dream!" "The outdoors isn't all it's cracked up to be!" We celebrated Nala's 5th birthday on the 17th. We visited a local PetValue store where we got her bags of treat, bullie sticks and a new collar. Needless to say she was one happy camper! To extend her birthday celebration she went riding in the car doing errands with her Pop on Saturday which also included a visit to PetSmart. This coming week also marks the 3rd anniversary of adopting Nala. Hard to believe it was 3 years ago that she came into our lives. She definitely helped to heal our hearts from losing Ozzie to lymphoma. She is a treasure and we are lucky to have her! If any of you out there are thinking of getting a bulldog or any dog for that matter, please consider adoption. There are plenty of deserving dogs out there looking for their forever homes! I don't know really who rescues who...it is a win,win situation! "Yup, I just too cute for words!"